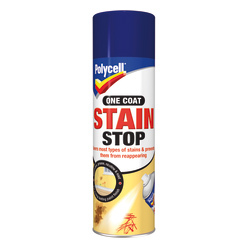 Polycell One Coat Stain Stop is a highly pigmented stain block aerosol paint which permanently prevents existing stains reappearing through paint. It provides one coat coverage over water stains, grease, nicotine, crayons, rust and soot. Also available in a paint for brush application. ToolsMasking tape and safety glasses. When applying it is advisable to wear eye protection. 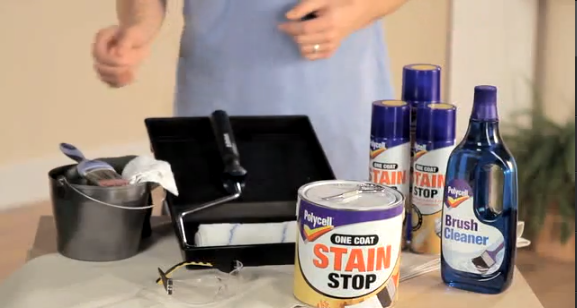 Spray evenly over stain from a distance of 20-30 cm (9″-12″) until stain is fully covered. If over painting with gloss or eggshell paint, first prime treated areas with water based paint. Masking tape and safety glasses.